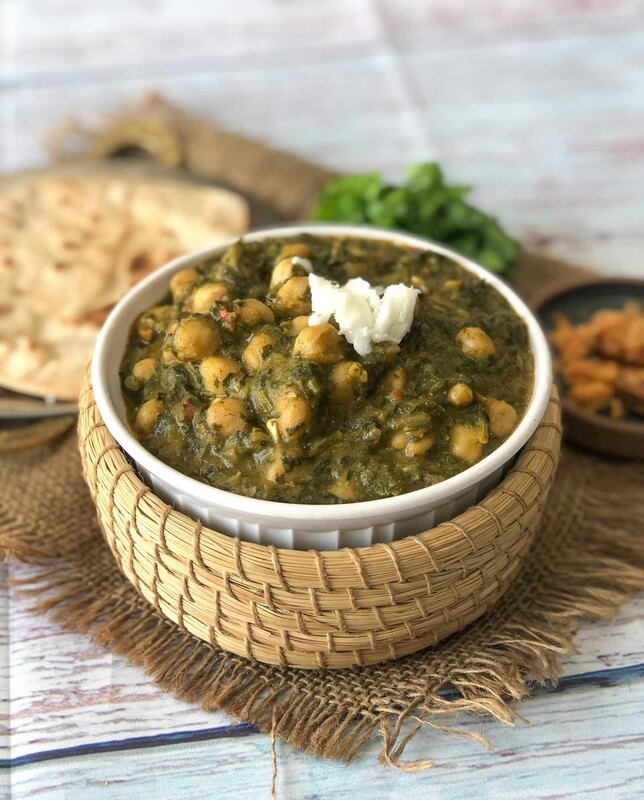 Sarson Chole Ka Saag Recipe is a lip smacking green gravy made of mustard leaves popularly known as sarson, paired along with kabuli chana, making it a lip smacking winter meal that you shouldn't miss out on. 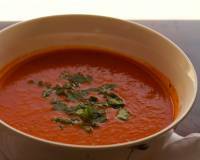 Serve it along with makki ki roti or just simple piping hot puris too. 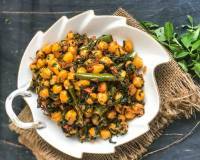 Sarson Chole Ka Saag Recipe is a highly nutritious sabzi made with the goodness of winter greens. Kabuli chana is boiled and dunked in a lush green gravy that is made by combining greens like mustard leaves - sarson, spinach leaves - palak and bathua leaves. These greens are pre cooked and given a tadka of onion- tomato and simple masalas. Since its made mostly during the winter season, it tastes great when the entire dish is cooked in ghee and topped with white butter before serving. Alternatively the dish can also be cooked in white butter. 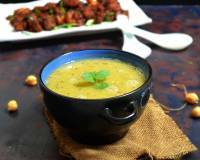 The ghee or white butter used, adds great flavour to the dish, making it finger licking good. Serve Sarson Chole Ka Saag Recipe along with Makki Ki Roti Recipe - A Classic North Indian Corn Roti, Gajar Shalgam Ka Paani Wala Achar Recipe - Carrot And Turnip Pickle, White Butter and Jaggery by the side to complete winter dinner. 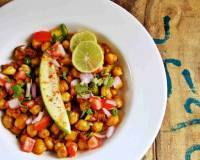 You could also serve Sarson Chole Ka Saag as brunch along with Puri Recipe - Learn to Make Soft Puffed Puris At Home, and Boondi Raita Recipe Spiced With Black Salt. 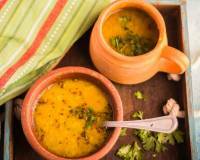 To begin making the Sarson Chole Ka Saag Recipe, firstly wash and soak the chana overnight. Next morning, transfer the chole along with the water into a pressure cooker with some salt, close the pressure cooker. Pressure cook for 6-8 whistles and turn off the flame. 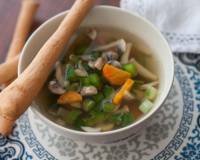 Allow the pressure to release naturally before you open the pressure cooker. Drain the excess water from the chana and set aside. In a pressure cooker, add the finely chopped sarson leaves, palak leaves and bathua leaves, along with 1/4 cup of water, salt, green chillies and garlic. Close and pressure cook for about 3 whistles and turn off the flame. Once the pressure releases naturally, open the lid and sprinkle the corn meal over it, using a potato masher, mash the saag well. Heat a kadai with ghee on medium flame, to this add the finely chopped ginger and garlic and saute for about a minute. To this add the finely chopped onions, and cook until it turns into a deep brown colour. Once the onions are brown, add in the chopped tomatoes and cook until they turn mushy. Mash the onion- tomato mixture with the back of the ladle. At this stage, add all the dry masalas - salt, red chilli, turmeric powder, cumin powder, garam masala, and coriander powder. Mix well and add the pre cooked greens, and chole and simmer for a few minutes until the Sarson Chole Ka Saag comes to a boil. Transfer the Sarson Chole Ka Saag to a serving bowl and serve with a dollop of white butter.